CONTACT RTA WEBSITE BECOME A MEMBER BECOME A MEMBER RTA WEBSITE CONTACT Cahaba Pressure Treated Forest Products Eagle Metal Products East Coast Railroad Gross & Janes Co. Hurdle Machine Works Koppers Inc. CROSSTIES • JANUARY/FEBRUARY 2018 4 45G RR Track Maintenance Credit Extended WASHINGTON—The American Short Line and Regional Railroad Association (ASLRRA) applauded Congressional action that extends the Railroad Track Maintenance '45G' tax credit retroactively through Dec. 31, 2017, as part of the Bipartisan Budget Act of 2018, signed into law by President Trump. "The Short Line Tax Credit (45G) extension benefits the 10,000 short line railroad shippers across the country," said Linda Bauer Darr, ASLRRA president. "The continuation of this credit is good public policy, allowing our industry to do its share toward improving the nation's infrastructure by incentivizing railroads to increase their capital investment. The extension will allow short lines to continue their success story serving rural, industrial, and agricultural America." The tax credit has assisted the nation's short line railroads in upgrading track and bridges to handle modern freight cars. Under the terms of the credit a short line railroad must invest one dollar for every 50 cents in credit, up to a credit cap equivalent to $3,500 per mile of track. The credit allows the short line rail industry to invest more of their own revenue to make rail transport safer and more efficient for customers across the country, many of whom would be cut off from the national freight rail network if not for short line railroad service. "A real thanks goes to our 56 senators and 251 representatives who have formally supported continuation of the Short Line Tax Credit over the year. This great bipartisan group of members of Congress from across our country understand how important this credit is to their communities back home," said Jerry Vest, chairman of ASLRRA's Legislative Policy Committee. "They, along with a diverse group of stakeholders like the American Association of State Highway and Transportation Officials and Saving Our Service, a nationwide group of short line rail freight customers, have all publicly stated how important this credit is to areas of our country that need more investment in freight infrastructure." Since its implementation in 2005, the tax credit has enabled short line and regional railroads to invest more than $4 billion of their capital into rail infrastructure, much of which was inherited in disrepair as spinoffs from Class 1 railroads after partial rail economic deregulation in the 1980s. "The Short Line Tax Credit has enabled our industry to make significant progress on upgrading and improving track, but there is much more work to be done including repairing aging bridges," said Judy Petry, ASLRRA chairman. "The credit drives economic and employment growth beyond simply the railroads —investing in better track spurs new investment by railroad customers, and railroad rehabilitation creates skilled jobs, particularly in rural locations." The short line railroad industry has called for permanence of the 45G tax credit via the Building Rail Access for Customers and the Economy (BRACE) Act, introduced in early 2017. The Act has broad bi-partisan support in Congress, and has achieved 250 co-sponsors in the House of Representatives (H.R. 721) and 55 co-sponsors in the Senate (S. 407). "The work to extend this credit into 2018 and beyond begins now. We look forward to working with Congress and making our case," Darr said. 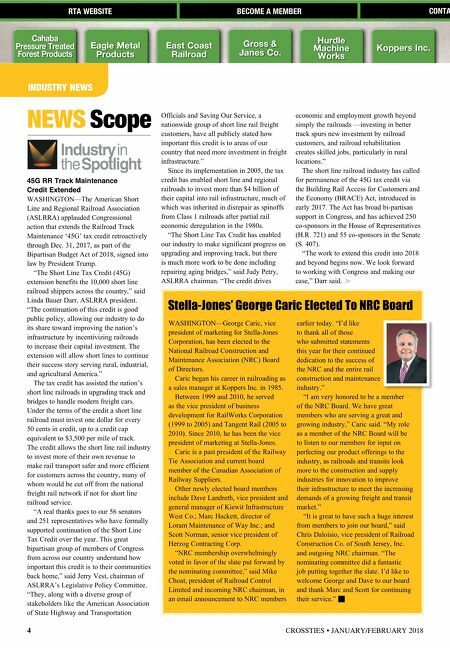 INDUSTRY NEWS Industry in the Spotlight NEWS Scope Stella-Jones' George Caric Elected To NRC Board WASHINGTON—George Caric, vice president of marketing for Stella-Jones Corporation, has been elected to the National Railroad Construction and Maintenance Association (NRC) Board of Directors. Caric began his career in railroading as a sales manager at Koppers Inc. in 1985. Between 1999 and 2010, he served as the vice president of business development for RailWorks Corporation (1999 to 2005) and Tangent Rail (2005 to 2010). Since 2010, he has been the vice president of marketing at Stella-Jones. 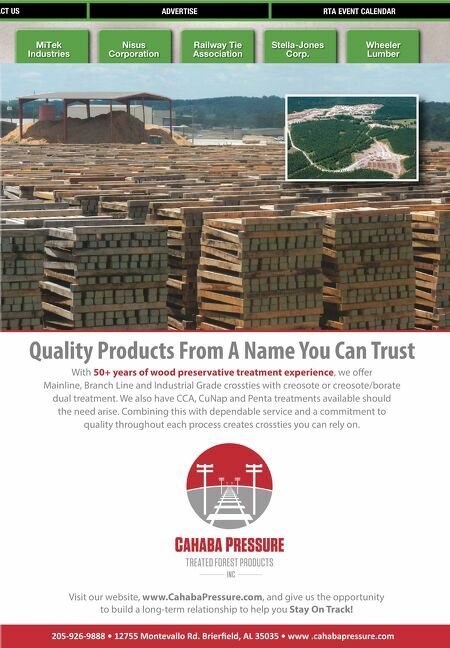 Caric is a past president of the Railway Tie Association and current board member of the Canadian Association of Railway Suppliers. Other newly elected board members include Dave Landreth, vice president and general manager of Kiewit Infrastructure West Co.; Marc Hackett, director of Loram Maintenance of Way Inc.; and Scott Norman, senior vice president of Herzog Contracting Corp. "NRC membership overwhelmingly voted in favor of the slate put forward by the nominating committee," said Mike Choat, president of Railroad Control Limited and incoming NRC chairman, in an email announcement to NRC members earlier today. "I'd like to thank all of those who submitted statements this year for their continued dedication to the success of the NRC and the entire rail construction and maintenance industry." "I am very honored to be a member of the NRC Board. We have great members who are serving a great and growing industry," Caric said. "My role as a member of the NRC Board will be to listen to our members for input on perfecting our product offerings to the industry, as railroads and transits look more to the construction and supply industries for innovation to improve their infrastructure to meet the increasing demands of a growing freight and transit market." "It is great to have such a huge interest from members to join our board," said Chris Daloisio, vice president of Railroad Construction Co. of South Jersey, Inc. and outgoing NRC chairman. "The nominating committee did a fantastic job putting together the slate. I'd like to welcome George and Dave to our board and thank Marc and Scott for continuing their service."